This week we return for a second report from the RSPB Nature Reserve, Dungeness. At Dungeness Operation Tree Sparrow has provided homes for tree sparrows by putting up boxes for them across the reserve. When a tree sparrow uses one of the boxes they build fluffy, cosy nests lined with feathers to lay their eggs in. Once the eggs have hatched the parents start to bring plant seeds and invertebrates to the nest, delivering them straight into the chicks open beaks. In a good year a pair might raise three separate broods of chicks with an average of 3-4 chicks fledging from each brood. An adult tree sparrow visiting its nest in one of our boxes; photographed by David Featherbe. Tree Sparrows are slightly smaller and shyer than house sparrows and they have a distinctive black patch underneath their ears. They are gregarious birds which means that they like to they stick together in a group. Tree sparrows are a Biodiversity Action Plan species which means they have declined significantly in recent years and so Operation Tree Sparrow is hoping to help strengthen the group here at Dungeness. 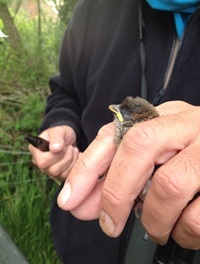 A young tree sparrow chick being ringed to help us to evaluate the success of Operation Tree Sparrow by monitoring the chicks reared on the reserve.